Ya know, some recipes are just hard to master. You follow the recipe to a tee and it comes out of the oven looking like something your 5 year old would have made. For me, that particular recipe is for biscuits. I’ve tried making them the way my mom did and nothing. I’ve followed other recipes. Zilch. Nada. Even the ones I made in my Introduction to Baking class at Johnson and Wales came out flat and dry. It was terrible. Me, a Southern woman, could not make a biscuit to save her life. What would my future kids say? Or even worse…what would my grandmother say? The woman who made biscuits every single day of her life while my mom was growing up. It would be an embarrassment to her to have a granddaughter who could’t make a fluffy and delicious, buttermilk biscuit. There is no trying in biscuit making. Only doing. The biscuit would not get the best of me! THE INGREDIENTS. Short. Simple. To the point. THE METHOD. The biscuit method. The pie crust method. Basically, the method to make things flaky, buttery, and delicious. It involves cutting the fat into the dry ingredients, adding the cold liquid, and mixing until the dough just comes together. THE CUT. 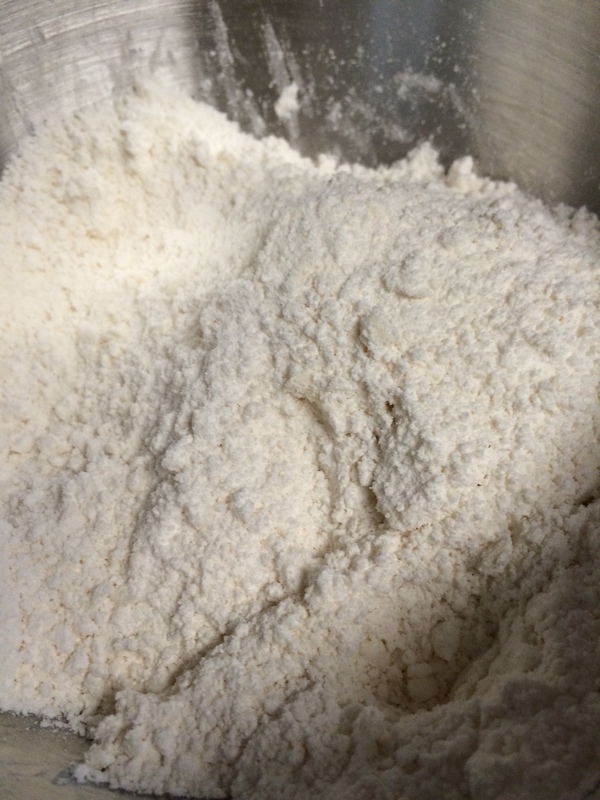 After all of the dry ingredients have been measured and sifted into a large bowl, we add the COLD butter. The butter should be cut into small cubes because this makes it faster to work them into the flour. You can use a cutting tool, but I usually just use my hands. The fat should be kept cold because this is what makes the biscuit flaky. The cold butter melts in the oven and creates a pocket of steam. These pockets create a flaky and delicate biscuit. If the butter is too warm when you cut it into the dough, you won’t get the flakiness, which would be sad. Incorporate the butter as quickly as possible. The mixture should now resemble corn meal. After you are finished, put the bowl into the fridge just to make sure the butter remains cold. Leave it there 10 minutes before adding in the liquid ingredients. THE MIX. Now that the butter has been chilled back down, it is time to add the COLD liquid. I’m using buttermilk because I love the tang that it gives to the biscuits. Cream is another good substitution due to its high fat content (Fun Fact: Fat makes baked goods tender…and more delicious, of course). So, add your cold buttermilk (cold keeps the fat solid prior to baking) and mix until the dough just comes together. You don’t want to over mix biscuit dough because that will make for some tough and abnormally shaped biscuits. THE FOLD AND ROLL. 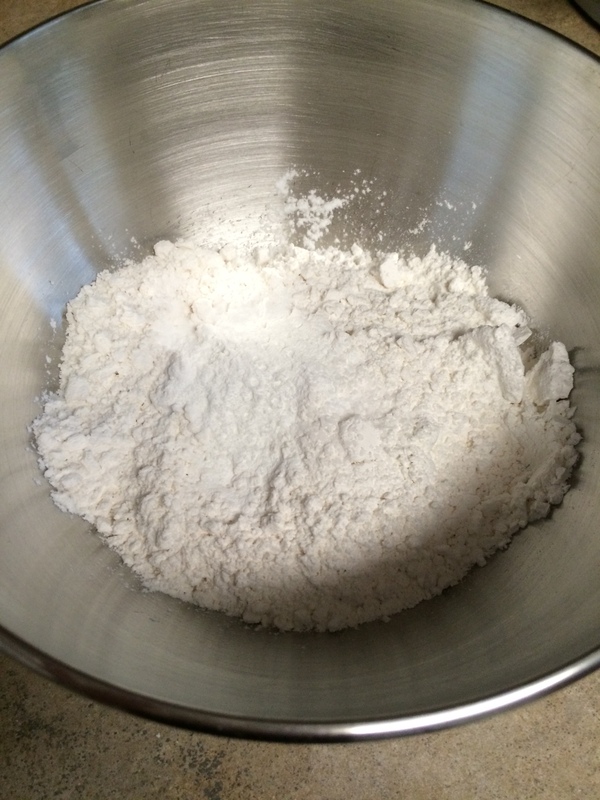 Pour the contents of the bowl out onto a lightly floured surface. Gently fold it 3-4 times just so the dough completely comes together. Roll the dough into a rectangle about 1/2 inch thick. Fold it in thirds like you are folding a business letter. Roll it back out to 1/2 inch thick. Repeat the folding. Now, roll it out to 3/4 inches thick (the shape is up to you) and use a biscuit cutter (any size) to cut the biscuits. It’s important that you push straight down and DO NOT twist the cutter. Turning the cutter inhibits the formation of the layers. The technique used here is similar to the technique used to make croissant dough and we all know how decadent and flaky croissants are, so it doesn’t hurt to borrow the technique for your biscuits. 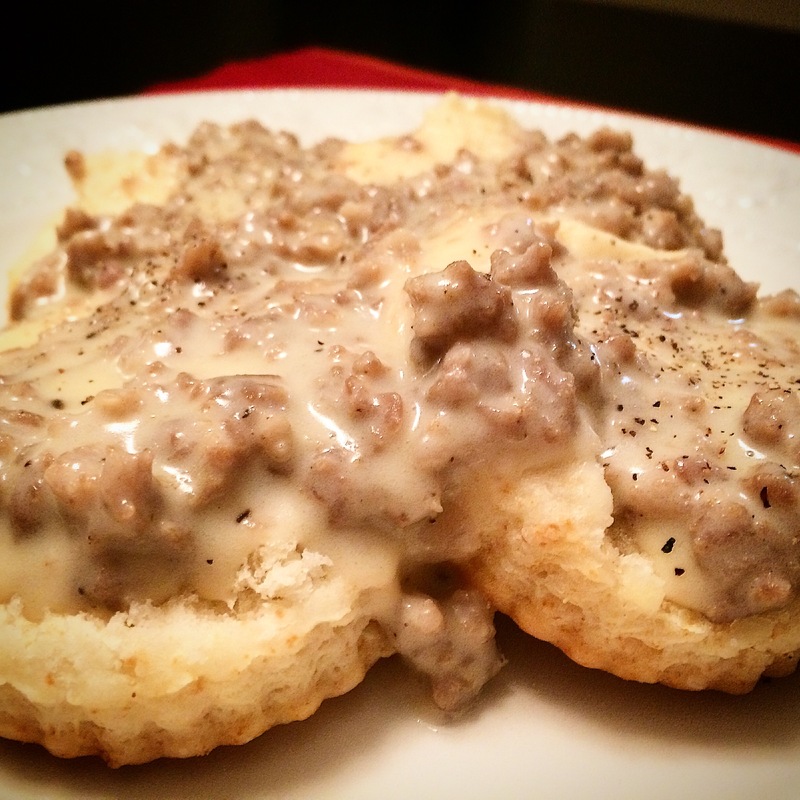 Slathered with sausage gravy…a recipe for another day! THE BAKE. 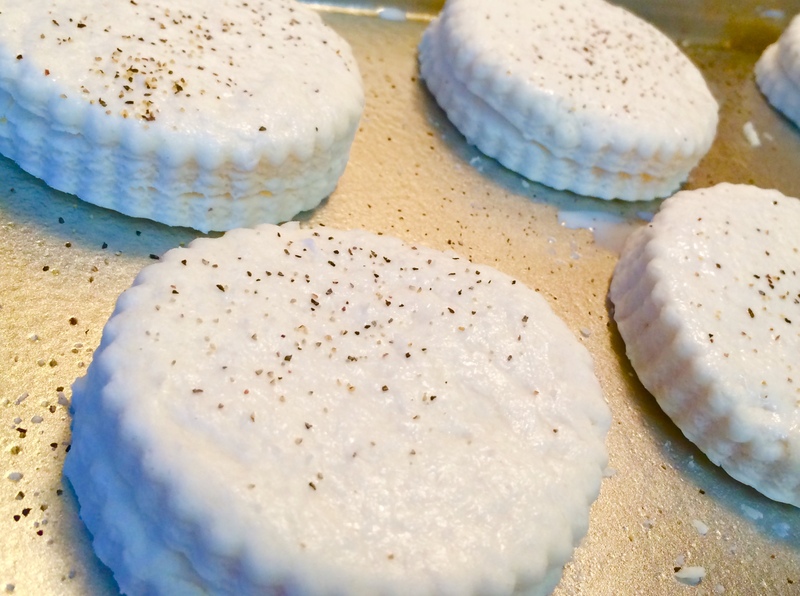 Place the biscuits about an inch apart on a lightly greased baking pan. Brush them with melted butter or buttermilk. I have also seasoned the tops of mine with a little bit of salt and black pepper. Bake them for about 15 minutes (or until lightly golden brown) at 400 F. I brush them with more melted butter once they are out of the oven because…well, why not? Butter makes everything better. ENJOY THEM. Now, open one of these bad boys up and slather with more butter or some jam. 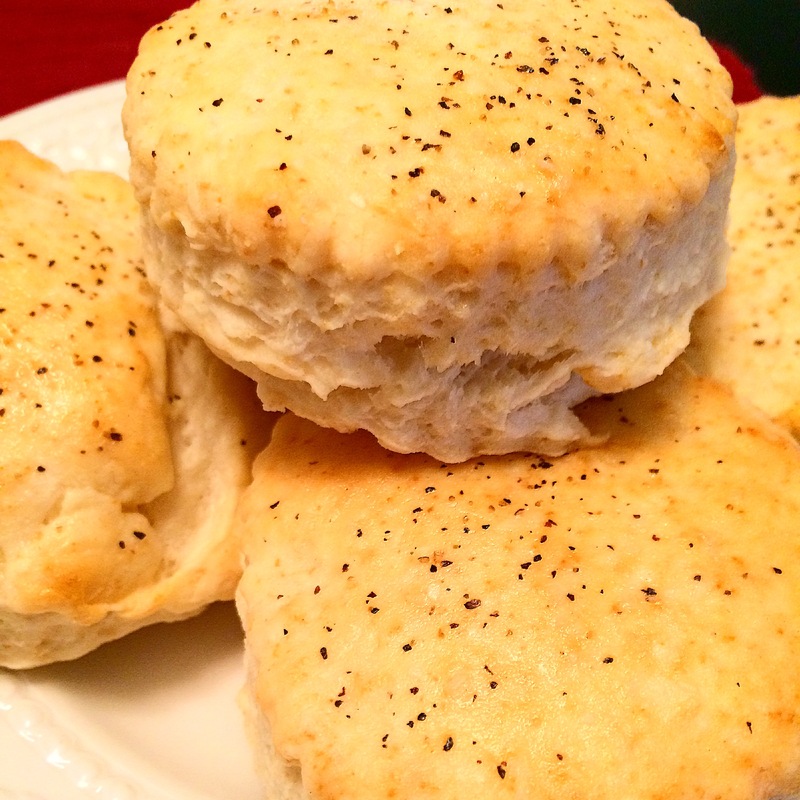 Bite into the flaky tastiness that is a traditional and Southern buttermilk biscuit. They are to die for. Or you can slather them with some sausage gravy. It’s really up to you. All that matters is that you make you some biscuits because like butter, biscuits make everything better. * You might notice that some recipes use shortening and others use part shortening and part butter. What gives? Well, shortening makes for a really flaky dough while butter adds some flakiness AND flavor. I wouldn’t make the biscuits just with shortening, but doing half-and-half would work out well.